Please contact Amanda Cunningham, Advertising Manager, at acunningham@vmdaec.com or 804-297-3429 for in-state rates and specifications. NCM member publication. Cooperative Living combines crisp color photography and lively prose to portray the people and places that define the rich character of the communities outside Virginia’s cities. As a publication for electric cooperative consumers, we also provide electrical efficiency and safety information, key utility trends and issues affecting cooperatives. Recipes, crafts, nature, and travel features also are monthly staples. 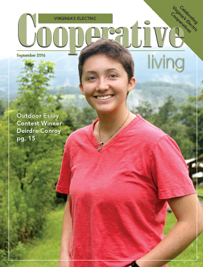 Cooperative Living has been recognized over the last decade with state, regional and national awards for its editorial content and photography. It features heavily interactive editorial copy and receives several hundred reader contacts monthly.